Chuoxian is a full-stack developer and tech company founder who has built multiple large-scale projects from blueprint to launch. In this post, we will walk through some of these well known and time tested Node.js frameworks that have relieved developers from having to reinvent the wheel over and over. To be more specific, in this article we will take a look at Express, Koa, Meteor and Sails.js. Instead of trying to figure out how each of these frameworks stack against one another, we will see the key areas in which each of these frameworks excel and how they are relevant to various project needs. It goes without saying that Express is the biggest deal for Node.js business. Every Node.js player has heard of it and is using it with or without noticing. It’s currently on its 4th generation, and there are quite a few Node.js frameworks built based upon it or inspired by its concepts. Most developers adore Node.js for its raw speed, and when it comes down to framework selection, a perfectionist may disdain any performance jeopardy. Express provides a thin layer on top of Node.js with web application features such as basic routing, middleware, template engine and static files serving, so the drastic I/O performance of Node.js doesn’t get compromised. Express is a minimal, un-opinionated framework. it doesn’t apply any of the prevalent design patterns such as MVC, MVP, MVVM or whatever is trending out of the box. For fans of simplicity, this is a big plus among all other frameworks because you can build your application with your own preference and no unnecessary learning curve. This is especially advantageous when creating a new personal project with no historical burden, but as the project or developing team grows, lack of standardization may lead to extra work for project/code management, and worst case scenario it may lead to the inability to maintain. Middleware are basically just functions that have full access to both request and response objects. As the name implies, middleware applies some filtering instruction before handing the control over to actual business logic or the next level of middleware. Some common tasks include like checking for user login status, validating user authority, or preventing cross-site attacks are best extracted as middleware. An Express application is essentially Node.js with a host of middleware functions, whether you want to customize your own middleware or take advantage of the built-in middlewares of the framework, Express made the process natural and intuitive. Template engines allow developer to embed backend variables into HTML files, and when requested the template file will be rendered to plain HTML format with the variables interpolated with their actual values. By default, the express-generator uses Pug (originally known as Jade) template engine, but other options like Mustache and EJS also work with Express seamlessly. As a minimal framework, Express does not consider database integration as a required aspect within its package, thus it leans toward no specific database usage whatsoever. While adopting a particular data storage technology, be it MySQL, MongoDB, PostgreSQL, Redis, ElasticSearch or something else, it’s just a matter of installing the particular npm package as database driver. These third party database drivers do not conform to unified syntax when doing CRUD instructions, which makes switching databases a big hassle and error prone. Koa is developed by the team behind Express, and its goal is to minimize the minimalist Express by not bundling any middleware within its core. Other than being middleware-less, Koa looks very similar to Express, lightweight and un-opinionated. However, what makes Koa truly standout is its way to ditch callback completely by using the ES6 Generator feature. One way to flatten callback nesting is to use Async.js. Async.js provides techniques to map, parallelize, serialize or iterate multiple functions without having to embed one into another and then pass over the control flow with a callback function, one callback and one error handling function is enough for the bulk of functions grouped together by an Async.js method. Yet Async.js cannot wipe out callbacks entire. When writing Node.js code with Async.js, the indentation of code still tends to drift to the right, just not as deep. We cannot jump to conclusions asserting that this cutting-edge technique is superior to old school solutions such as Async.js, Promise or event emitter, but one thing is for sure that this new concept does take some time to get used to. With the unconventional control flow sequence, it could bring extra difficulty to code debugging. If you look closely under the hood, you will notice that Meteor is really Node.js+Blaze/AngularJS/React+Cordova+MongoDB. Node.js and MongoDB are respectively responsible for server side business logic and data storage. One of Blaze, AngularJS, or React takes care of front-end UI. And Cordova, as the most famous HTML solution for mobile hybrid apps, bridges web pages to mobile views. One of the features that distinguishes Meteor from other frameworks is its data synchronization mechanism among server and front-end/mobile apps. In Meteor, the client holds a mini-database shadow copy which is a small portion of replication from server database, a portion that is previously requested by the client and is authorized by server. When the client wants to make any changes to the data, it uses the consistent database API as server side to perform any CRUD instructions, and then data changes will be automatically sent to server and saved in the actual database. Whenever the server detects any data modifications, it will push the updated data to specific clients that subscribe to those data. This bi-directional data synchronization is accomplished automatically without any manual intervention. In order to create this magic, Meteor is using WebSocket to connect client and server under the hood so that any data changes on one end will be reflected to another instantly. Overall, Meteor is a highly automated framework. This high level automation makes developers’ life much easier, yet it comes with a cost of jeopardized performance and scalability restrictions. As the user base grows, the automated data synchronization technique becomes the scaling chokepoint. 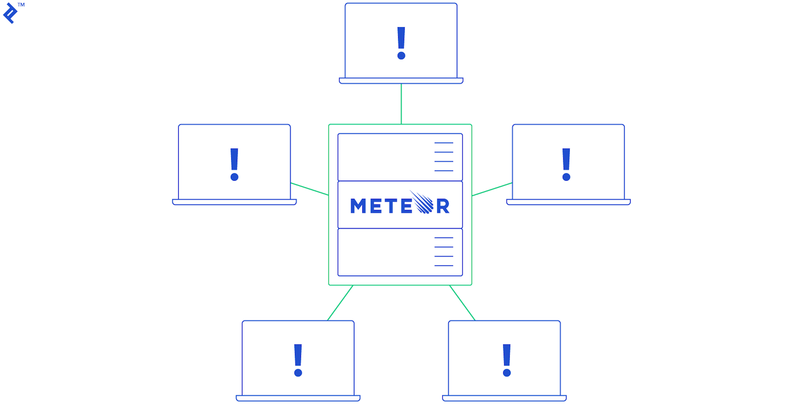 To achieve the same capacity and performance as other hand-tuned backend technologies, Meteor usually consumes much more server hardware and bandwidth resources. So Meteor could be a great starting point and a perfect toolbox if one wants to prototype a project for all major platforms, but eventually at some point the system architecture has to be redesigned in a more professional way if the prototype becomes a production project with enough client base. Sails.js shares many similarities with Express. It’s a project generator, middleware and templating engine. It is in fact built on top of Express plus some higher level functionalities to speed up development. Sails.js adopts Model-View-Controller design pattern from its core. For those coming from Ruby on Rails or Laravel, they will find the structure for a Sails.js app all too familiar. Model represents data model that reflects database table/collection schema, View is HTML view with filled in data, Controller is where you put all server-side business logic in and acts as a glue between data and view. Not like an HTTP request where the client has to query for server data every time, or long polling connection which puts server in idling mode, Socket.io establishes a bidirectional event-based communication between client and server. Sails.js integrates Socket.io and wraps it up with some higher abstraction level API to provide more convenience, thus making Sails.js especially suitable for creating chat apps or multiplayer games. Between backend logic and actual database manipulation, there is a middle ORM layer called Waterline. Simply put, this ORM tool provides a consistent syntax to access different databases without developers having to be concerned about varied database query languages, like SQL vs NoSQL, schema vs schema-less and so on. Sails.js has an intermediate automation degree. It focuses on the server side logic and is production ready, and it provides a faster developing pace than Express without sacrificing any performance or future scalability. In particular for the large quantity of MVC pattern devotees, Sails.js has quite a smooth learning curve. This article isn’t ranking different Node.js frameworks, rather it lists the shining spots of each framework to stand out from the crowd so as to help Node.js developers pick up the most suited toolbox when building a project from the ground up. So which is your favorite Node.js framework for web development? Do you prefer some framework other than the ones we discussed above? Let us know in the comments section below. Chuoxian is a self-driven full-stack developer and tech company founder with nearly a decade of experience developing with forefront technologies and fulfilling client needs. He's fully capable of designing or building large-scale projects from blueprint to launch. He possesses solid computer science theory and a deep, broad programming knowledge base. In addition, he is an excellent communicator and software architect. Great article ! it really shines the nice features from each framework I'll probably add HapiJS and one of the coolest feature is been a plugin based framework great for extend functionality and also minimalist since you only plug what you really need. I read the article's headline and thought: "not again". But it was actually a good read. Check out http://feathersjs.com/. It is build on top of Express and very lightweight. To hell with all frameworks. I always feel dirty when I am required to use them. Is it fair to say that an article is great because you read your own opinions very well put? I think yes it is! Let me say it "Great article!" -By the way, I think that taking the most representative/extreme frameworks, there's not an urgency to present the others which invariably tend more towards minimalism or turn-key. Yeah I know, for simplicity maybe simply node.js+npm will do, but frameworks do boost up development speed, so why not. Always nice to have options. Not sure at this point that there's much difference between ionic and meteor, certainly on the same trajectory if you look at all ionic infrastructure services on the backend. Meteor has definitely got me addicted, usually I work in a more traditional way (say php, dB, webserver. The development speed that Meteor allows is impressive, I can focus more on what matters rather than reinventing the wheel. This is why I use Meteor in my hobby projects as well as side projects. The community is huge, many questions I had got solved quickly; getting your webapp to mobile is super easy! If you have time, give it a try. Where does loopback stand in here? Hey Yang Chuoxian, I just started my journey with NodeJS and your article was a good read for me. But I have to agree with Kevin A Jasti and Stephen Buchanan, what do you say about Loopback? At this moment, I'm trying to put access restrictions on all endpoints using ACL syntax according with loopback documentation... :( someone can help me? I agree, Loopback is actually more mature than any of the above except Express which it's built on. Its inbuilt models like Users, ACLs and other stuff save several weeks of development time. In my opinion Meteor is more commercialized i.e. Advertised as compared to Loopback which is a mature and well-rounded framework. One of the fastest web frameworks on nodejs worth checking is https://github.com/kikwit/kikwit. I wish to know the possible cloud platform or hosting services that support Loopback. I started Loopback and had a hard time hosting it. Can it be hosting on AWS? Could you explain what kind of hard time you are having? Its just a node app, so it should not be any different from any other node app. this is such an awesome article. Been using sailjs for more than a year. Currently using it at www.highlyreco.com. Totally in love with sailjs.. it is just super awesome..
Any thoughts about Adonis.js framework? Adonis js is far far better than the big names hear... soon it will be most popular like laravel. I wish some big companies support this adonis js developer to make something great! how did you deal with deep populate ? I always respect people who take the time to share their insights by writing articles or contributing to the community, however this selection of frameworks seems pretty random to me ... what is the rationale for listing these 4 frameworks and not others? Express as the 'mother of all frameworks' is of course a given, but why mention Koa but not Hapi or Loopback? As others have mentioned, AdonisJS has by now far surpassed SailsJS in terms of capabilities, performance and reliability. Finally, if you mention Meteor (which is really the odd one out, being not just a backend but also a frontend framework) then I'd recommend FeathersJS as a much simpler and more lightweight alternative. I think Express is simple and best. Loop back fails: 1: If you need complete customization on User, ACLs and Organisation level ACLs different type of login support. 2: If you want to use flexibility of Mongo DB native driver and mongoose.